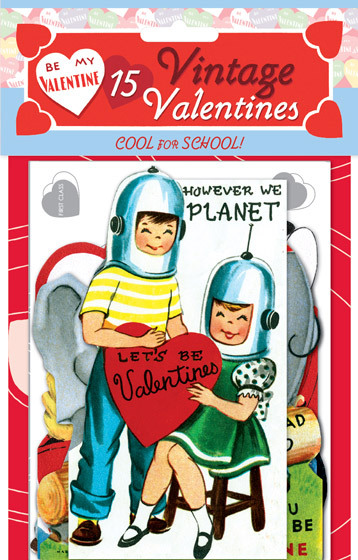 15 unique die-cut reproductions of vintage valentines featuring adorable animals and sweet children, plus printed envelopes, our Cool for School card packet brings the whimsy on Valentine's Day. Each of the fifteen images was carefully selected and reproduced from Laughing Elephant's treasure trove of antique paper ephemera. Our six Valentine's Day card packets, each only $11.95, include 15 different die-cut cards with decorated envelopes. The cards measure approximately four by six inches.